After our "Vooscoop Festival" up in the mountains, we find our selves celebrating in a magical olive, orange and lemon tree forest at an paradise location by the deep blue sea. With a lot of gratefulness in our hearts, we thank you all for your support and fun shared with us all these past years. And as years go by here we find ourselves celebrating our fifth year anniversary. As such we are opening our arms on gathering Gathering of the Tribes of Montenegro, Serbia, Macedonia, Kosovo, Albania and Greece all together as one. 3 days of the finest LIVE music and art performances 31 August, 1 and 2 September to close the summer in great style! We have thought of a variety of fun for all of us also by dedicating one night to GOA in our Hybrid Garden. We recommend for all to arrive on the 30 August (this will be a FREE night at the camping) to accommodate and get ready for the opening ceremony on Friday. More info will be updated as we go by making to raise positive energies and vibes together as one. Below is the list of artists in "continuous update" as they confirm availability. ★ Afrodizzy ★ ▶ Lotus Feet rec. ★ Psoma ★ ▶ Stereohemia rec. ★ Omnium ★ ▶ Stereohemia rec. ★ Simia ★ ▶ Hypnotique rec. 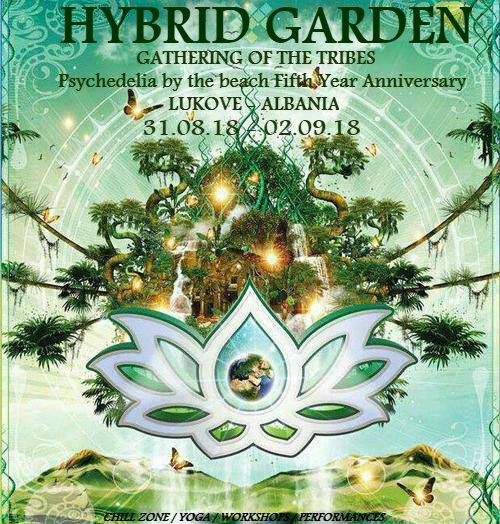 The concept of this event is to unite and gather together as one the psychedelic tribes of Balkans. We as a family will raise positive energies for Mother Earth. We are found on a private and separated olive tree land by the sea. It is a paradise place. We will put signs on the road to make your way easier.